Natural Environment Teaching (NET) is a way for children to LEARN THROUGH PLAY! 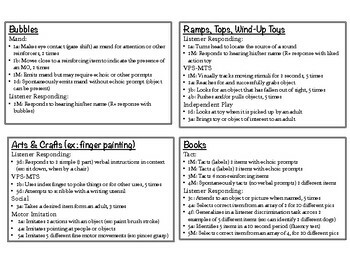 These cards help teachers and therapist see what skills to target while engaging in play activities with children. 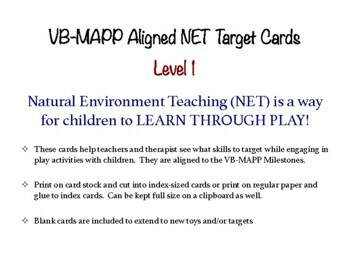 They are aligned to the VB-MAPP Milestones and work great for teachers and therapist using Applied Behavior Analysis (ABA) programs. 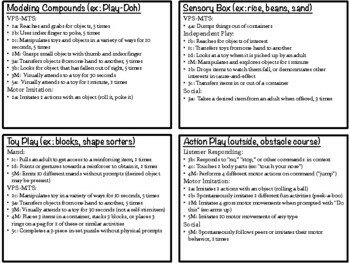 Targets/goals provided for the following 8 activities: Bubbles; Books; Arts & Crafts; Ramps, Tops, Wind-Up Toys; Modeling Compounds; Sensory Play; Toy Play; and Action Play. Print on card stock and cut into index-sized cards or print on regular paper and glue to index cards. Can be kept full size on a clipboard as well. Includes a page of Tips for Success when implementing an ABA-based NET program.